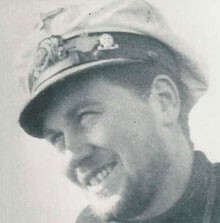 Patrol 58, U-566 under Hans Hornkohl, 4 days August 7th to 10th, 1943. “At 18.15 hrs, the boat was attacked by a second PV-1 from NAS New York and again replied with AA fire. One of the four depth charges dropped actually hit U-566 and bounced off before exploding, but caused no damage. The Germans again misidentified the attacker as a Mitchell and scored several AA hits after it passed over the boat, causing the burning aircraft to crash at a distance of some 1200m. All five aircrew were lost. U-566 then made for the crash site, having sighted a rubber dinghy, but before it was reached another Ventura (VB-126 USN, pilot Lt J.R. Smith) from NAS Quonset and a PBMMariner flying boat (VB-211 USN, pilot Lt E.C. Scully) from Elizabeth City arrived at the scene. The U-boat fired at the aircraft (misidentified as a Mitchell and a Lerwick), and then dived at 18.29 hrs. The Ventura immediately dropped four depth charges. The depth charges detonated without effect, but U-566 was forced to surface by a malfunctioning diving tank and manned the AA guns again. The Mariner was hit as it made several passes while its eight depth charges hung up, until the emergency release was used. According to Wynn (Vol. 2, p.43), the patrol was a litany of attacks on the U-boat, and even the sole successes: the mining of Chesapeake Bay by 12 MTB-type mines on 29/30 July produced no result and the sinking of the USS Plymouth (PG 57, 2,265 tons) off Hatteras only brought more Allied anti-submarine activity upon Hornkohl and his men. The boat was attacked on 2 August unsuccessfully by a Mariner, and was tracked by aircraft and a blimp after sinking the USS Plymouth, which was protecting a convoy. On 7 August, the day it entered New England waters, Lt. F.C. Cross in a US Navy Ventura (VB-128 Squadron) attacked U-566 but the aircraft was counter-attacked, damaged, and forced to crash-land. Cross, already injured, died in the water, but his crew mates were rescued by flying boat (Wynn). After all of the above-listed attacks and after the sub “held off the Mariner, two other aircraft, and two blimps until darkness came and it submerged,” the boat was sighted under the moonlight by a Mariner aircraft southeast of Nantucket but escaped. Then on the 8th in the morning a Halifax-based Catalina spotted her and vectored in three US Navy destroyer escorts from Norfolk, Virginia. Using the Aphrodite decoy radar device the sub again managed to escape. This patrol began in Brest France on the 5th of July and ended 59 days later on the 1st of September 1943 (Wynn, Uboat.net). Hans Hornkohl was born in Hamburg in April 1917 and is – amazingly considering the close encounters of this patrol alone – still alive at age 98 at the time of this writing. A member of the Crew of 1936, he was initially seconded to the Luftwaffe for long-range naval reconnaissance (Busch & Roll, p.108). He received commander sea-training in U-753 April to December 1942. Hornkohl then skippered 6 U-boats, more than any other commander in this study. They were U-566 to October 1943, U-1007 to July 1944, U-3509 to November 1944, U-3512 to April 1945, U-2502 to mid April 1945 and U-3041 to May 1945 and the capitulation. U-566 was sunk under Hornkohl’s command 30 miles from Portugal and Spain on the 24th of October 1943 by a Wellington bomber piloted by Sargeant Donald Melvin Conrish, who disabled the sub but then ran out of fuel and had to leave the scene. Hornkohl had his men abandon ship in rafts and scuttled his boat, to be rescued soon thereafter by a Spanish trawler (Fina). The men snuck into France as civilians on a train and took over U-1007 later (Uboat.net, citing Franks, Ritschel). Hornkohl, having evaded death and capture during the war was held POW until August 1945. He sank one ship (USS Plymouth) and received no decorations (Uboat.net, Busch & Roll).